Pixels doesn’t earn a spot on the leader board. The Arcaders are here to save the world. It all starts out with some degree of promise. It’s 1982 and video arcades are all the rage. A video game competition sponsored by the big gaming guns of the day (Atari, Konami, Namco, Taito, Nintendo) is videotaped and the recording is included in a time capsule launched into space by NASA. The outer space beings who intercept the capsule view the video, which naturally shows kids playing interstellar war games like Space Invaders and Galaga, consider it a declaration of war and, 33 years after that championship, they begin an assault on Earth. Okay. The story’s a stretch. But it is summertime fare. The real problems begin with the introduction of the President of the United States, President Cooper. He’s played by Kevin James. Now that’s a stretch too far. James is a funny guy, a real winner in TV’s The King of Queens. But when it comes to movies, the highest ranking official he’s played has been a mall cop. No. 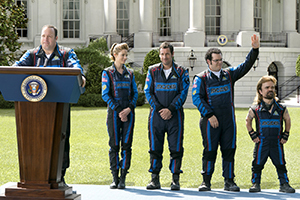 James just can’t sell being POTUS, not even in a summer Adam Sandler comedy. And it doesn’t help matters much that President Cooper’s childhood friends, Sam (Sandler), a TV installer, and Ludlow (Josh Gad, The Rocker), a conspiracy theorist still living with his grandma, are burdened with the responsibility of saving the planet. That is, it’s up to Sam, Ludlow and Fire Blaster (Peter Dinklage, HBO’s Game of Thrones), the Donkey Kong king of 1982 and Sam’s bitter video game rival who’s been spending time in the slammer for sundry charges. Pixels could’ve been an all-ages crowd-pleaser. Think about what Disney pulled off with Wreck-It Ralph and its teaming of multi-brand, multi-platform video game characters, similar to what Who Framed Roger Rabbit did in bringing together all those marvelous cartoon characters. The opportunity was there for Pixels to be on par with those movies, to be something truly special and cross-generational. The reality is not so much. The notion of Adam Sandler starring in a Chris Columbus-directed movie raised the question of who would come out on top in the duel of cinematic sensibilities; Sandler, the star of raunchy comedies like Happy Gilmore and Big Daddy, or Columbus, an ‘80s wunderkind screenwriter who made a big splash with Gremlins and The Goonies, going on to direct blockbusters including Mrs. Doubtfire and Harry Potter and the Sorcerer’s Stone. Turns out Columbus is outnumbered by Sandlers’ clan. Pixels’ screenwriters, Tim Herlihy and Timothy Dowling, working off a 2010 short film by Patrick Jean, have collaborated with Sandler in the past. And so it is the tone, unfortunately, goes more for the lazy and the crude. Is anybody up for watching Q*bert pee on the Donkey Kong stage? Instead of zany, it’s oftentimes lame. What’s striking about Pixels is its complete lack of heart. There’s no reason to care about any of the humans; let them get crushed by Centipede. At least Q*bert is almost sympathetic, but it’s still a bad move and movie for the Q*bert brand, along the lines of Norah Jones debasing her personal brand in Ted. The movie makes some brief inroads into social commentary with observations about the state of video games in the ‘80s (memorizing patterns and attempting to rack up the highest score while being social at the arcade) versus today’s open world, narrative-driven adventure games played online that are all about survival. Inroads are made, but they don’t really lead anywhere. And Sandler, surprisingly enough, isn’t the worst part of the movie. That’s not to say he’s terribly sympathetic, even as a guy pushing 50 who works for the equivalent of the Geek Squad, but he’s not grating, either. Sam knows his life hasn’t added up to much, familiar turf for Sandler characters, but there’s a faint attempt at making Sam - almost - relatable. It doesn’t add up to much. The romantic entanglements are ridiculously sloppy and unconvincing — and they’re not particularly funny to boot. The movie ends with one major unanswered question: Who’s it for? Young kids shouldn’t appreciate Sandler’s crude humor and the collection of ‘80s gaming characters and vehicles, from games such as Burger Time, Paperboy, Zaxxon and Asteroids, certainly won’t do much for them either. Those desperately in love with the ‘80s — including its super models, TV shows and pop stars — might appreciate what amounts to a nostalgia trip, but even Sandler’s die hard fans might find his latest character too low-rez.